Sean Dyche feels Burnley wll take on “arguably the most fluid team in Europe” in Manchester City tomorrow. The Clarets will look to preserve their unbeaten away record – and stretch their longest top-flight run without defeat since 1975 – against Pep Guardiola’s men, who have won their last 10 games. It is a daunting task, but, having won at Chelsea and Everton, and drawn against Spurs and Liverpool, it is one Dyche is relishing. City looked ominous in their 2-1 Champions League success against Serie A leaders Napoli on Tuesday night at the Etihad, with their football in opening up a 2-0 first half lead as good as anything an English side has produced in recent years. 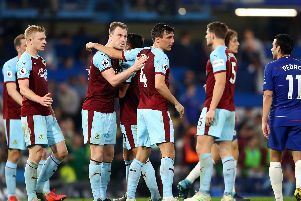 Dyche said: “For the first half an hour or so, without a shadow of a doubt certainly, they were outstanding, but it’s not so long ago Manchester United were playing like that under Sir Alex. “The manager has had time to work with his players, and there have been less changes of shape and personnel, so there is more familiarity, more connections on the pitch, all the things that take time to effect. “At other clubs he might not have had that time, but they are a fine team, and that is what they look like – a team, with and without the ball. “They started similarly last year, but our challenge is to focus on what we do. “They are one of the most fluid teams in Europe and it’s a tough ask, but these games always are against the super powers. City look capable of unlocking teams who bank in, and those who press them high, and Dyche added: “We will formulate a plan we think can affect the game, and we’ve done that very well so far this season. “But City have dislodged teams in various ways. He will again be without Dean Marney, Nahki Wells and Jon Walters, though the former pair played in a behind-closed-doors game with Sheffield United on Tuesday: “Deano got another 45 minutes, which was pre-planned, whether he felt brilliant or not. “Nahki got 90 minutes, but both will take time to get their true fitness back. “It is like a pre-season for both of them. “Nahki played 90 minutes but needs more time yet.